Notice how the word “provocation” is uttered by Smith just like it was voiced by him on last Friday’s show. There was no recant. There was no contrived apology given. 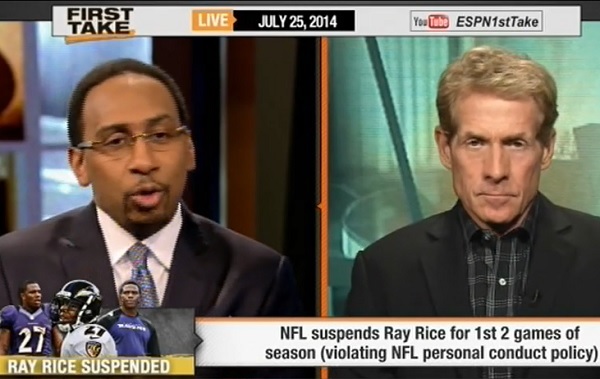 As a matter of fact, Smith wasn’t even reprimanded by the fine executives at ESPN. Now some of y’all will give the excuse, “That was different and Evelyn has a history of being confrontational and aggressive.” Be that as it may, it only highlights what Stephen A. was trying to vocalize when he said the word provoke. In no way was he “insinuating” that it was okay for a man to put his hands on a woman. On the contrary, just as he believes it’s not okay for a man to hit a woman; he is also tried of the men being vilified in such cases and we don’t ever scrutinize the woman’s role in a domestic dispute. Such is true in the case with Ray Rice, who’s now wife, Janay Rice, admitted she played a role (by hitting him) in her ultimately being assaulted. Of course no one knows the full details of the entire incident, however, I believe Stephen A’s point was that in some (definitely not all) instances it’s not always the man being the aggressor or antagonist. Maybe Stephen A. knows what psychologist Dr. Elizabeth Bates has already concluded when it comes to intimate relationships: women tend to be more aggressive and controlling than their male counterparts (http://www.telegraph.co.uk/men/relationships/10927507/Women-are-more-controlling-and-aggressive-than-men-in-relationships.html).